Discussion in 'Gameplay Discussions' started by Vujkan, Jan 23, 2019.
hey all.i wanna ask you if you know whats changes BlueHole do it on this game? !which engine use and which combat will be in this game Tab or Action combat?! Still UE3 but heavily modified and from what we can see grounded combats might be both Tab-targeting or Free-aiming according to your class and mounted combats are Free-aiming. S Tab-targeting or Free-aiming according to your class and mounted combats are Free-aiming. 100% info? whats the source? As mentioned before, we don't know yet if all classes are meant to be Tab-targeting but it appears that range classes obviously use some sort of Tab-targeting lock (aim reticule visible). The user interface being disabled, it kinda prevents us to know if melee classes also use the same playstyle or not, could be both without certainty. could be both without certainty. All Classes are Tab-targetting with no Free-aiming. Some AOE Skills of certain Classes are non-Targeting. An AOE Skill is not supposed to lock to a single Target. An example of this are the Spin-to-Win of Warlord and Assassin, the Whirlwind of Mystic, and the AOEs of Gunslinger. They are Non-targeting that works on 2-dimensional Space Search and Collision Check on 2D volume (same as TERA's but not 3D volume). If you are speaking about "Free-Aim", then technically, these certain AOEs are not Free-Aim, they are just Non-targeting. A "Free-aim" is like an FPS-game, it has 3D Volume for Collision Check and a Crosshair for Aiming 3-dimensionally (TERA is one of these Free-Aim games). What I see in this game, is wherever you aim on a 2D Space Search, the Collision Check is 2D. That is not technically Free-aim, and Tab-targeting MMOs like Revelation Online has the same thing for their Non-targeting AOEs! It's exactly the same thing and works the same way! This screenshot below is technically an example of a Free-Aim which is 3D. Tell me, have we ever seen anything like that from the new overhaul? Even without the UIs nor a presence of Crosshair, I can tell that nothing is 3D, Tab-targeting or not for whatever Skill! So this "Free-Aim", it doesn't exist! It exist in Airships, Mounts, Mechs, and Stationary Guns, the same way it works in TERA - not in Characters. i can understand for combat, but use UE 3 not optimized and can not be optimized, because enigine is ****ed up totaly!! i think its better to upgrade to UE 4 alot better enigine!! The user interface being disabled, it kinda prevents us to know if melee classes also use the same playstyle or not, could be both without certainty. What you are seeing from the video regarding the Melee Classes is "Free-Aim" of the Camera, not "Free-Aim" of the Combat. What happens when you move the Mouse is you change the angles of your Camera that gives you your Field of View. Movement is WASD, Camera Angle is Mouse. But judging from the video though, the Melee Classes are Tab-targeting. The same Combat as before, nothing changed regarding the Targeting. A Free-Aim has 3D Collision Check - What is the point of Aiming 3-dimensionally if the Collision is 2D? Let me give you an example. The Berserker in Bless Online has what you call an Action Combat. It has 3D Free-Aim of Camera, but the Collision, it doesn't lock to a single Target, it has what you call a 2D Space Search and 2D Collision Check (not 3D). The only thing that has a 3D Free-Aim in the Berserker of Bless is the Camera, the Combat is not literally and technically a Free-Aim because the Collision is still 2D. That's why it's so easy to implement this in Melee Classes like the Berserker of Bless. The only thing 3D really is the Camera, not the Combat. Everything that you see in that video is 2D. The Space Search is 2D, the Collision Check is 2D. Think about it in Volume in a game that is 3D in graphics (obviously!). In the Berserker of Bless, you can have a 3D Free-Aiming of Camera, it doesn't change a thing, the Combat is still 2D in Volume (front, back, left, right) regarding Collision. It just gives you the illusion of 3D Free-Aiming (because of the Camera) when really it's not! When you swing that Axe to hit multiple Targets around that Berserker, do you think the Collision happen in 2D or 3D? It happens in 2D (there is no vertical in the Collision)! It's not Free-Aiming Combat, it's Free-Aiming Camera and that's all it is! The Berserker in Bless is not an example of a Free-Aiming Combat. A Free-Aiming Combat is PUBG and TERA which have 3D Collision, not 2D! Now, watch this video of an Archer in TERA. It has 3D Collision (you can Aim Vertically in Pitch with respective Collision - upwards/downwards, not just Longitudinal and Lateral), not just the Camera. That is what you technically call a "Free-Aiming". Look at this and tell me if it's Free-Aim. It has Free-Aim Camera but the Collision feels like Isometric isn't it? Front, back, left, right. That is all that you will worry about regarding the Collision, there is no vertical (up and down). That's 2D because it only has Longitudinal and Lateral for the Collision, no Vertical! It doesn't matter if the Camera does, the Collision doesn't! But it's the wrong thought, that's the point! What "Free Aim" are you talking about when there is no 3D-Collision to be found in the Character Combat? I had to explain the technical because you don't understand what a "Free Aim" is! It is obvious from the video that there is no Free-Aim, the Character Collision Check is built for 2D alone. The infrastructure that we have is different, so it's not possible. @Eternal : Sorry but the way you usually answer by writing a novel with multiple chapters is just too tedious to me, I'm not going to read that but I believe you're right on this point. I'm personnaly not planning to study game developing and like most of us I'm just waiting for a good game whatever the playstyle. Thanks for your time though. Exuberance and Lu_Bane like this. I'll write simple and short then, this time! I'm just waiting for a good game whatever the playstyle. 1.) I think there is nothing wrong with the Targeting in this game. 2.) The problem in the Combat, I believe, all lies in the Casting of the Skills (it is Rotational because everything is locked on Cooldowns, Stances, Stacks, Modern Stamina - mechanics that are Rhythmic). A Rythmic Combat does not work in a Dynamic environment! What you need is freedom of Dynamics! 3.) I believe the way to go for the Casting of Skills, is how Archeage did it (it is a Button-Mash, yes, but on a PVP-situation, it requires you to be Tactical). Make it Resource-based, and add Casting(animation)-Times with interruption - never add Rhythmic-based. Don't lock the Skills on mechanics that are Rhythmic (Cooldowns for re-Casting, etc.). Use whatever Targeting System we have in this game (I'm sure there is a technical reason why the Devs chose such Targeting System). Make it a Button-Mash like Archeage by giving freedom (it works in a PVP environment as already proven in Archeage). In PUBG, in Battlefield, in Call of Duty, do they lock your Combat-Actions to Rythmic mechanics? No! - they give you freedom! And as proven from there, it requires you to be Tactical in a PVP environment. Nupy, Laguna, CreativeX and 1 other person like this. lets hope not ****ing trash TAB Target in game,its too boring,old and slow,Action combat is future for gaming,and y i think they upgrade enginte to UE4 because UE3 is bad optimized engine,not working great in massive pvp thats problem!! (Tera,bless,Mu Legend and more games) no one work fine in pvp and massive zerg!! y Arika but still looks bad in graphics,sorry but its 2019,poeple want good graphics and good gameplay!! 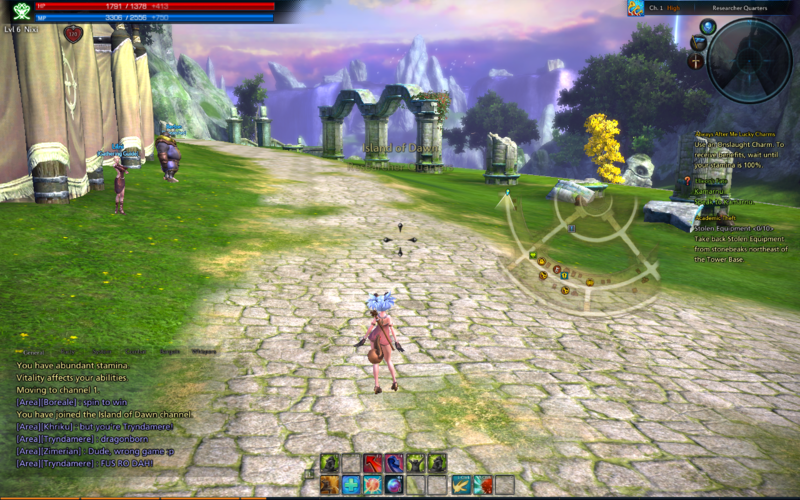 I remember good days in tera i play 5 years and i enjoy in game,but now i think i cant play anymore this game :/!! I hope this guys upgrade to UE 4 soon!! don't worry this game will be wonderful and enjoyable funny. then oke i hope they works fine in siege wars/zerg pvp ! !